free performances, roundtables, artist talks, and dance films. Seven international guest artists from Italy, France, Ireland, Wales, England, Croatia and Vancouver will be teaching workshops throughout the week. The VIVDS training intensive offers opportunity for vertical dance practitioners to expand their aerial technique, vocabulary, share knowledge and develop networks with artists across the seas. New practitioners with athletic ability are welcome to participate in various workshops. These workshops will be held in different settings within Vancouver. Venues (pending final approvals) include a short outdoor wall, an indoor atrium, a studio theatre, old growth trees and a tall office tower. The event will culminate in a public showcase of “The Gathering Flock” on June 15, featuring the week's Tall Tower exploration. Sign up today to Aeriosa's newsletter to receive new information and updates regarding workshops, schedules, prices, and registration. 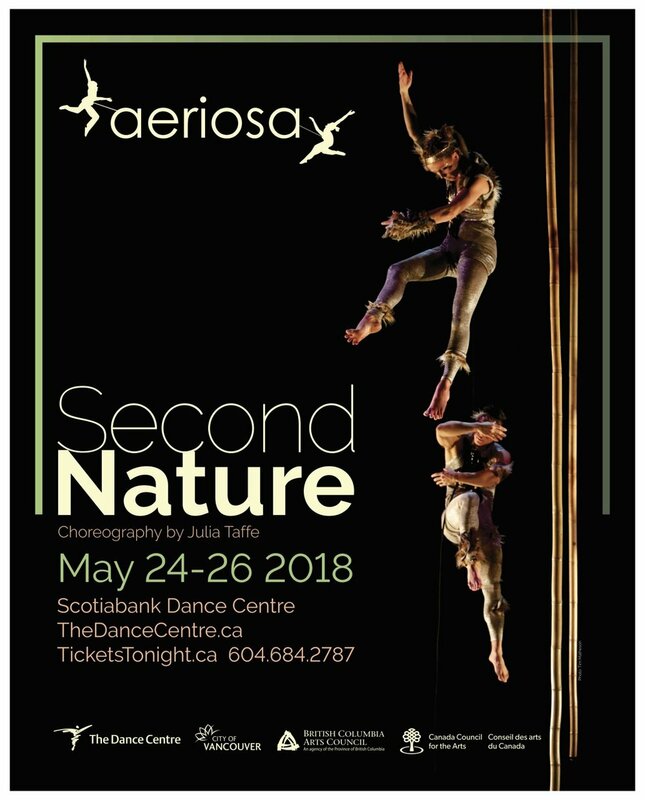 Join Aeriosa and the gathering flock next week! Viewing tips: Some public seating is available in the Oxford Properties public plaza below the dance wall or; bring your own camping chair, yoga mat or picnic blanket and stretch out under the trees at Portal Park next door. This installation-style presentation progresses over two hours each evening and changes throughout the week. There is no exact start or end to the show. This awesome free event begins at 11 am. Aeriosa will be performing in the trees between 1 pm and 4 pm. More information below. The gathering will include a community feast, storytelling, workshops, and fun activities for all ages. The event is free and transportation from all communities will be provided at no charge. Parking will be provided at no cost. On behalf of the Clayoquot Biosphere Trust, Yuułuʔiłʔatḥ Government, and Pacific Rim National Park Reserve, you are respectfully invited to a regional gathering. As a UNESCO designated site, the Clayoquot Sound Biosphere Region has an opportunity to fulfill the mandate of peace-building at a local level. Together, we have an opportunity and a responsibility to respond to the Truth and Reconciliation Commission Calls to Action. In the spirit of healing and reconciliation, we will come together to recognize our unique strengths, shared history, and cultural diversity. All communities, residents, and visitors are invited to mark this moment and move forward in a positive direction for the future of our region. For more information, please contact Rebecca or Brooke at 250-725-2219. Drop by Saxe Point Park this Friday or Saturday evening. Vancouver-based Aeriosa is being brought to Esquimalt courtesy of the Township Community Arts Council as part of its summer of family friendly activities and entertainment.Aeriosa will do three performances starting at 6:30 p.m. and lasting until sunset. As parking within the park is somewhat limited, attendees are encouraged to walk or cycle to the venue. If possible, bring blankets and/or chairs to be able to enjoy the event comfortably. Pseudotsuga – Earth to Sky is an interspecies collaboration between vertical dancers, live musicians and a grove of old-growth trees in Vancouver’s Stanley Park. This piece is a new extension of our a collaboration with Spakwus Slulem Eagle Song Dancers, acknowledging the park as traditional Coast Salish territory and calling attention to the oldest trees as living witnesses connecting dancers of the past, present and future. The full presentation of"Pseudotsuga - Earth to Sky" and "Trees Are Portals" will premiere in Stanley Park in 2017. Intro to Dancing on Buildings for Professional Performers...Take to the Sky! Practice vertical techniques and choreography while ascending and descending the 26 meter exterior wall of the Scotiabank Dance Centre. Participants attending this workshop will apply the skills learned in the studio workshop, ascending as well as descending on ropes from the roof, practicing side by side with Aeriosa dancers and guest instructors on the Dance Centre wall. Intro to Vertical Dance for Professional Performers... Learning to Fly! Classes take place in the Faris Studio Theatre at Scotiabank Dance Centre. Each day begins with a group warm up followed by special exercises designed to improve core strength and stability while hanging in a harness. This unique performance by the captivating vertical dance group, Aeriosa, incorporates a captivating fusion of rock-climbing skill and contemporary dance movement set to music. Celebrate summer solstice with a unique performance by the captivating vertical dance group, Aeriosa, while exploring Vancouver's most exciting eco-adventure attraction, Greenheart Canopy Walkway. Spectators will be able to see a captivating fusion of rock-climbing skill and contemporary dance movement perched on viewing platforms high in the treetops on the canopy walkway.